Storytellers travel through the Library District all year round to share engaging stories, songs, fingerplays, and more! All ages are welcome. Books, puppets, songs, children stories, crafts, and much more all year round! 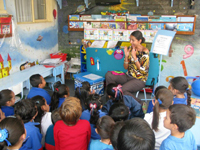 This Spanish program is free and for all ages. 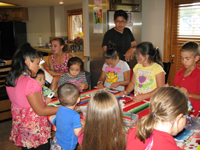 Noches en Familia (Family Nights) is a time of children's stories, crafts, puppets, and music in Spanish, that invites fluent speakers as well as those interested in the Spanish language, to enjoy an afternoon in community and family. This event is free, for all ages, and in Spanish. Once a month the Outreach Services Department offers a combination of a traditional and digital storytime. 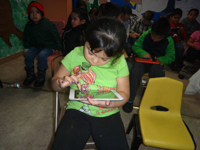 We provide kids with mini iPads to follow along with the presentation of a book or do a digital activity with them. We have selected top-rated educational apps that promote digital literacy. If parents are not comfortable having their little ones handling a tablet, we offer a book for them to read until the activity is over. When: Every Thursday 4:15-5:00 p.m. When: Tuesdays during the school year, 9:30-10:15 a.m. When: First Friday of the month, 5:00-5:45 p.m. When: Third Friday of the month, 4:30-5:30 p.m.
Bauder Elementary, Irish Elementary, Livermore Elementary, Putman Elementary, Stove Prairie Elementary, Timnath Elementary, Salud Family Clinic, Northside Aztlan Community Center, Teaching Tree, The Family Center/El nidito, Harris Elementary, University Village, Aggie Village, etc.